We rely on representative, not participatory, democracy. The plurality electoral system exaggerates the parliamentary majority of the biggest party and allows it to control Parliament. A politically neutral civil service acts according to ministerial wishes. The prime minister controls cabinet and ministers. We may also identify an adversarial style of politics and a ‘winner takes all’ mentality which tends to exclude opposition parties. The government is responsible for the vast majority of public policy and it uses its governing majority, combined with a strong party ‘whip’ to make sure that its legislation is passed by Parliament. Power is centralized and government policy is made from the top-down. In turn, the government is accountable to public, via Parliament, on the assumption that it is powerful, responsible and takes responsibility for public policy. Vertically – at supranational, national, regional and local levels ((hence multi-level). Horizontally – shared between government departments and a range of non-governmental and quasi-non-governmental (quango) bodies (hence governance rather than government). The hook is that we are witnessing a major transformation: from national governing institutions to supranational and sub-national governing institutions; and, from central government to the different levels of government and non-governmental organizations that interact with them. MLG identifies blurred boundaries between formal and informal sources of authority which make it difficult to identify clear-cut decisions or power relations. In the international arena, MLG suggests that it is difficult to identify sovereignty within national governments. Rather, they are tied increasingly to the policies agreed between states and implemented by international organizations. 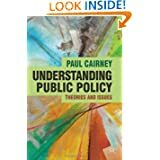 In the domestic arena, the interdependence between public and private actors (and levels of government which share responsibility) suggests that governments do not rely solely on formal decision-making powers. Instead, they may choose (or be forced) to ‘steer’ rather than ‘row’, negotiating the delivery of public services with a range of organizations, when in the past they delivered them directly. Privatization. The sale of public assets, break up of state monopolies, injection of competition, introduction of public–private partnerships for major capital projects, and charging for government services. Quasi-markets. One part of the public sector competes with another for the ‘business’ of commissioning agencies. Reforming the civil service by giving them more responsibility to manage their own budgets, and separating the policymaking and delivery functions in government departments. The increased use of quangos (often to bypass local government as a delivery body) – public bodies sponsored by government, but operating at ‘arm’s length’ from elected policymakers and administratively separate from government. Contracting out – commissioning non-governmental bodies to deliver public services. People like Rhodes have argued that the overall effect of these ‘new public management’ reforms, combined with a process of devolution and Europeanization, is a decline in the capacity of central government to control public policy. The rise of new ways to deliver policy – from a unified civil service and accountable local government to a ‘patchwork quilt’ of quangos and non-governmental organizations – has produced service fragmentation and barriers to effective communication. 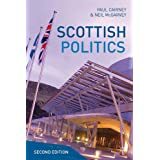 It has also diminished accountability to Parliament via ministers, with much responsibility devolved to agencies, quangos and the private sector or lost to European institutions. The counter-case is that the government was never effective at controlling peripheral functions of the state such as the nationalized industries. Governance changes, such as privatization and civil service reforms, mark a return to core competencies, with the centre making strategic decisions and creating accountability and regulatory mechanisms to ensure that these functions are carried out by others. The second approach is conceptual, considering the extent to which any system can concentrate policymaking power in the ‘core executive’ even if it tried. 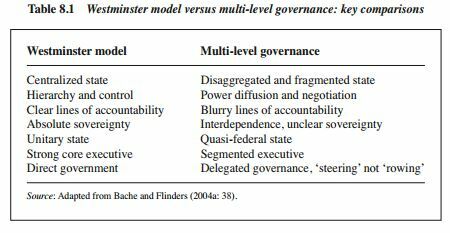 ‘Governance’ can be traced to a universal problem in which policymakers have to find ways to deal with the disconnect between their huge responsibilities and their ability to pay attention only to a tiny proportion of the things for which they are responsible. Policymakers devolve the responsibility for policy management to civil servants. Unelected civil servants, unable to secure the attention of ministers, tend to seek legitimacy through consultation. They also depend upon groups for information and advice. The result is policy networks/ communities, or policymaking relationships between those in formal positions of responsibility and those who seek to influence them. It is difficult to attribute responsibility solely to the former. Decision-making authority is dispersed and policy outcomes are determined by a series of negotiations between various levels of government and interest groups. Our focus shifts from formal powers and the capacity to make and enforce decisions, to the much more messy systems in which the distinction between formal and informal sources of authority becomes less meaningful. With decision-making responsibility shared across multiple levels of government (and with non-governmental actors), formal responsibility may be less important than a willingness to engage in policymaking and negotiate with other jurisdictions. 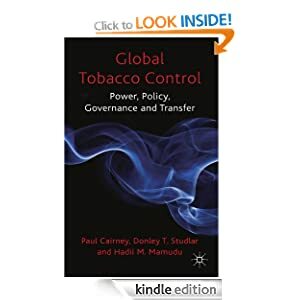 In effect, MLG continues and extends a policy networks focus on the move from government sovereignty to a loss of decision-making control and the need to negotiate and share decisions rather than impose them. This conceptual focus allows us to make connections between our study of different countries. Consider, for example, how this discussion of MLG (largely in Europe) compares to my description of punctuated equilibrium as it began in the US.